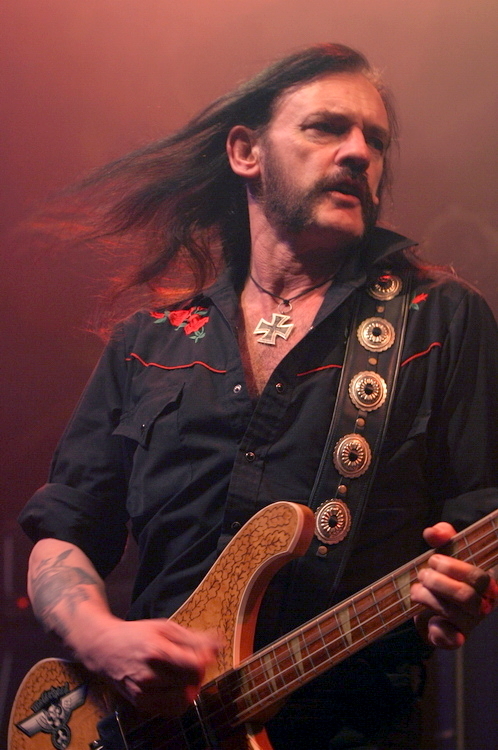 Lemmy Kilmister was a singer, bassist and song·writer. He was in the band Motörhead. Lemmy Kilmister was born on December 24, 1945 in Staffordshire, United Kingdom. He died on December 28, 2015 Los Angeles, USA. Lemmy has never been married. He has 2 sons from 2 different women. The sons are called Sean and Paul. At the age of 15, he stopped going to school. At the age of 16, he left his family. To get money he worked menial jobs. For example, he worked at the factory. And got a job at as a roadie on The Jimi Hendrix Experience. He played in various small band. For example, he joined The Rainmakers. And thereafter he joined The Motown Sect. From the year 1965 until the year 1967 he has in the band The Rockin 'Vickers. There he played the guitar. After that he played in the band Sam Gopal. Since the year 1972 he played in the band Hawkind. In the year 1975 the band fired him. There was an incident on the border between USA and Canada. They put Lemmy for 5 days in jail. But the border guards found out. The drugs are not cocaine. In the year 1975, speed was not banned in Canada. They released Lemmy out of jail. After that Lemmy founded his own band. The band was there from the 1975 to the year 2015. Lemmy has always played with other bands, too. Or written songs for other bands and musicians. On December 24, 2015 Lemmy has become 70 years of age. On December 26, 2015 doctors said: Lemmy has cancer. On December 28, 2015 Lemmy died.